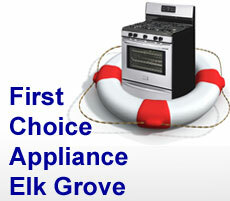 At First Choice Appliance Service, Elk Grove, we use a flat rate pricing for the repairs your appliance needs. The service fee is $55 for domestic residential appliances*, which is waived if you approve our estimate and we repair your appliance. The service fee includes our visit, diagnosis of your appliance, looking up the parts and giving you a written estimate. Our repair quote includes repairs, parts and tax. There are no hidden fees or additional charges. There are no extra charges for evening or Saturday appointments either. Our repair rates are based on a standard National Major Appliance Service Price Guide. There is no extra charge for additional visits if we happen not to have a part to repair your appliance during initial visit. Service fee for an additional appliance during the same visit is $30*. We accept cash (preferred), major credit cards, PayPal, and most checks. We service and repair most brands of major appliances. Appliance types that we service include: Refrigerator, Washer, Dryer, Dishwasher, Stove, Oven, Range, Cooktop, Garbage Disposal, Built-in Microwave. Please call us (916) 420-3756 and we will schedule your appointment for the most convenient time for you. We look forward to welcoming you as a customer and servicing your appliance today! * Service fee and repair for stacked washer or dryer and exotic brands of appliances, such as Asko, Bosch, Creda, Dacor, DCS, Fisher & Paykel, LG, Samsung, Sub-Zero, Thermador, Viking, Wolf are $10 higher. Commercial appliances - call for service fee quote, not all brands and types serviced. Appliance repair in Elk Grove, CA - First Choice Appliance Repair Service. All rights reserved.